In the 200-meter dash, James ran a 21.28 to finish 24th in the NCAA. He was unable to qualify for the final round of competition with that mark. This concludes James’ sophomore outdoor campaign, where he was named Most Valuable Athlete and Most Outstanding Performer by the Big Sky Conference. “It was a great experience to look out at all the competition and see what I have to do for the upcoming year and start preparing for next year and the year after that,” James said. “There’s a lot of people here and you have to be ready for a different environment when you come to a meet like this. James has two years of indoor and outdoor eligibility remaining for Southern Utah. 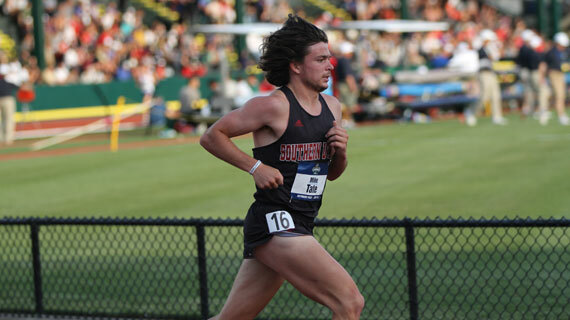 Tate, on the other hand, ran his final race for the Thunderbirds on Wednesday in the men’s 10,000-meter. The Canadian finished 21st in the field with a time of 30:14.75. Both competitors earned Honorable Mention All-American status for their performances. The conclusion of this meet also brings the 2017-18 academic calendar to a close for Southern Utah Athletics.